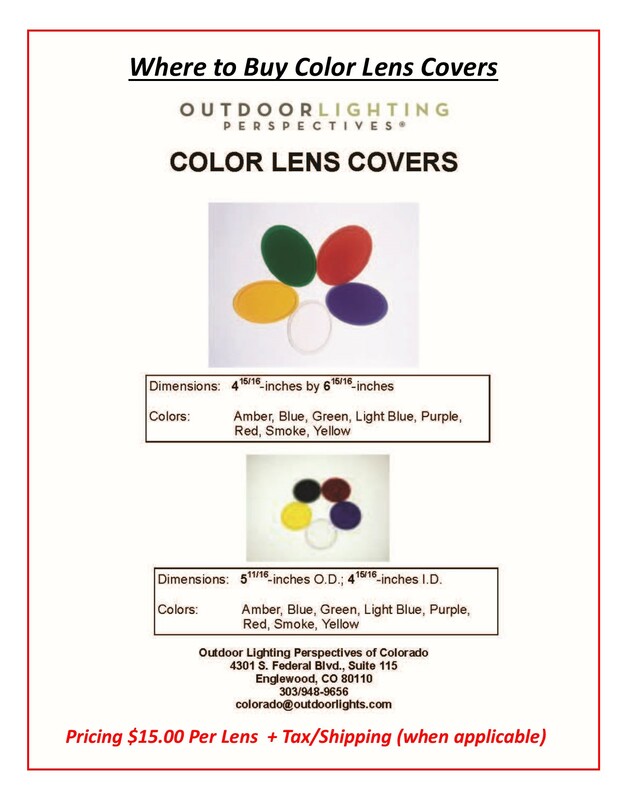 Over the last 15 years, we’ve been asked repeatedly about the availability of color lens covers for landscape lighting fixtures in general, and for the well lights that Outdoor Lighting Perspectives of Colorado sells and installs in particular. As you can see in the graphic to the right, we do have color acrylic lens covers for the oval (above ground) well lights and the circular in-ground (flush mounted) well lights. These lenses are designed and manufactured to specifically fit the dimensions of the OLP well lights. The lenses are available in the following colors – amber, blue, green, light blue, purple, red, smoke and yellow. What options do you have if your spot lights are smaller diameter (say the diameter of MR16 bulbs) or if your well lights have a different configuration than the OLP well lights? There are two viable options for the owners of non-OLP systems. The first option is to simply lay or tape the OLP color lenses over the aperture of the existing non-OLP fixtures. The important thing to remember is that the lens should never come in contact with the bulb! The second option is to find your nearest photographic or theatrical supply store, and purchase some rolls or precut squares of color gels that come in any color imaginable. You would then need to secure these gels to the landscape lighting fixtures using heavy-duty rubber bands or all-weather tape. The gels are not as durable as the acrylic lenses so you may need to purchase a new set of gels at the beginning of each holiday season. Happy lighting and Happy Holidays from Outdoor Lighting Perspectives of Colorado!